№28648970 Olkhon island in early spring. Shaman rock and Baikal lake at sunset. №28648969 Olkhon island in early spring. Shaman rock and Baikal lake at sunset. 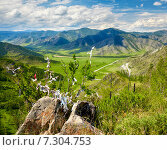 №25451109 Obo - religious sign of shamanism on the hill above Tola river valley, Ullan-Baator, Mongolia.